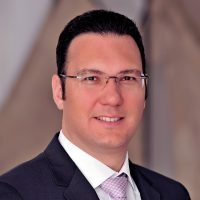 Ahmet is a co-founder and Managing Partner of Mediterra and serves on the investment committee. Prior to founding Mediterra, Ahmet was with KKR in London where he had the responsibility of expanding KKR’s investing activities in Turkey. He has been involved in several leveraged buyout and growth equity transactions in Turkey and in Europe and executed the largest buyout in Turkey at its time of completion, the UN Ro Ro acquisition. Ahmet served on the Board of Directors of Pages Jaunes (PAJ.PA) and UN Ro-Ro. Ahmet has an MBA from Stanford University, BSc in Applied Mathematics and BA in Business Economics from UCLA. Ahmet serves on the Board of Directors of Arzum, Tavuk Dunyasi, Glasshouse and Pizza Pizza. He previously served on the Board of Directors of ACP.